These blue scrubbing pads are manufactured to be used with the Square Scrub Doodle Scrub. These are pretty aggressive pads that can be used for heavier cleaning and buffing situations. They can also be used as a spacer pad to be able to thoroughly use a strip pad, a buff pad, and a grout scrubbing pad. We recommend that you check both the spacer and cleaning pads before each use and frequently while in use to check for wear and replace as needed. These pads when used for cleaning, can be used either wet or dry on VCT and title. Can be used for heavier cleaning and buffing situations. 18 pads per case. For more cleaning options with the Doodle Scrub, please take a look at our full line of floor pads for the Doodle Scrub. Customers who were interested in the Blue Scrub Pads & Driver for Square Scrub® Doodle Scrub® - Case of 18 were also interested in the following items. 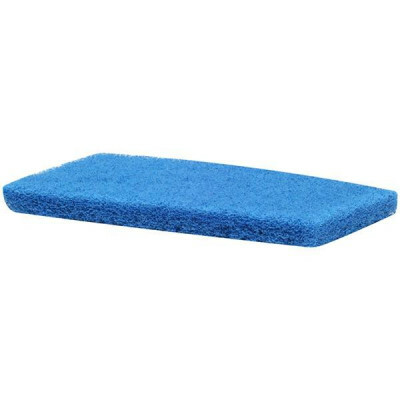 This is a review for the Blue Scrub Pads & Driver for Square Scrub® Doodle Scrub® - Case of 18.